Imagine Riding a Horse Through An Oven. For 7 Hours. Sebastian is getting to know the signs of a pending NATRC ride: a bath with soap at 9 in the morning, silly looking braids for the forelock and tail, much awkward maneuvering of the truck and trailer around the paddock in order to get a hose to reach the water tank, etc. During this prep day I also convinced B to take a short work break to install the latest bit of awesome camping gear I have acquired. 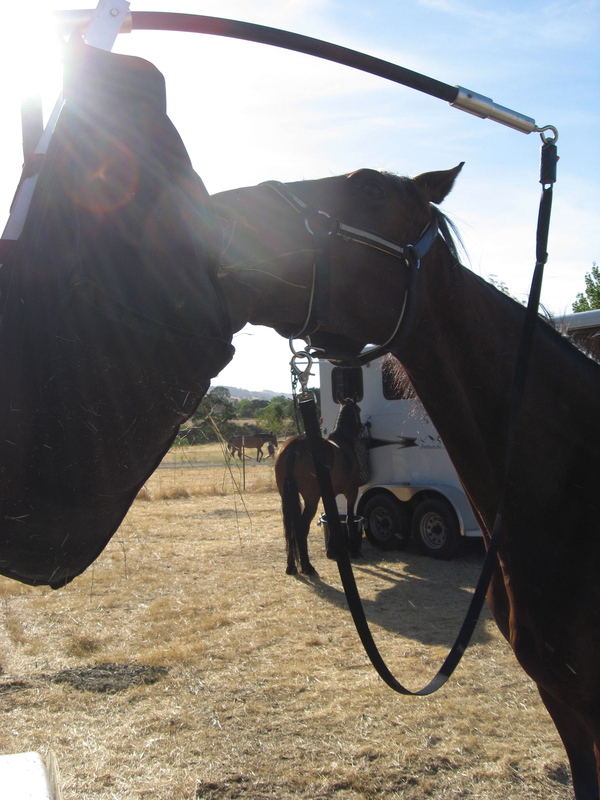 After the last ride I was talking up the overhead ties that lots of folks use to secure their ponies to the trailer. 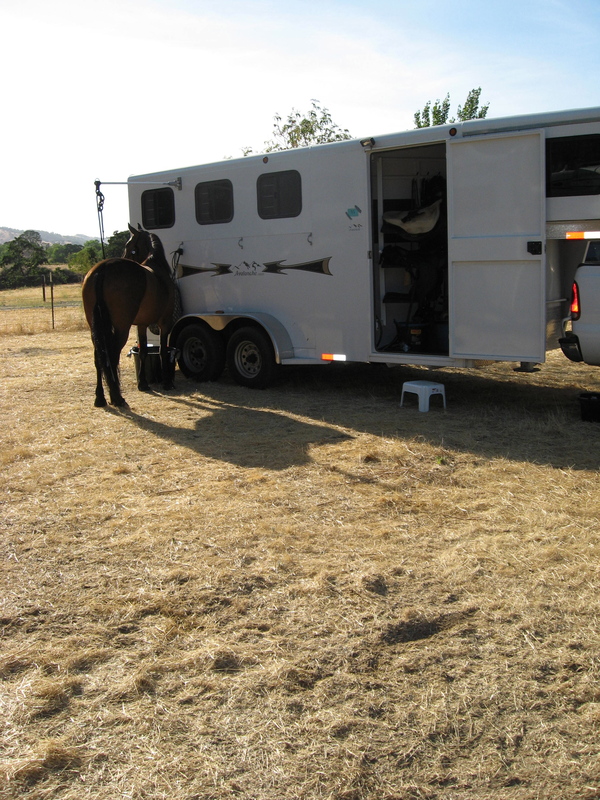 They allow the horse much more room to move and make them a little less likely to be tangled up with the trailer as they eat or lie down. After running through the pending holidays and realizing that nothing was coming up soon to use as an excuse to get me one of these things, B said “Hey, I want a HiTie for Father’s Day!” The man has not only been studying his Husband Handbook, he has added a few new pages. Turns out “short” is not the length of time needed to drill a set of two perfectly spaced, level holes through 3 layers of steel, but we got it done and it was worth it. Well, it was worth it to me and Sebastian (sheepish grin). My dear friend Jill went early to the Round Valley camp site and saved us the exact same spot we had last year, including the exact same inconveniently placed bush that served as a marker of my poor horse trailer backing skills once again. Here is Bastian enjoying the relative freedom of his fabulous HiTie. Yes, that’s the bush and its friend making bunny ears on the trailer. Jill’s horse Pokani has the TieRite model. All went fine with the vetting in. Carol, the veterinarian judge, ordered no snakes at this ride so we didn’t see any of those. Last year there was a very generously sized rattle snake found in camp, so I was thankful. The best part of the vet check was when Carol said Sebastian’s body condition score (a measurement of how fat or thin a horse is, on a scale of 1-9) was a 6! We have had huge struggles in this department- last fall he was an 8 (fat). At home I do a lot of feeling for ribs and poking at the spongy fat pads at the base of his tail, doggedly trying to measure the imperceptible day to day changes in his weight. Recently I have been hoping he was down to a 7 (fleshy), so when I heard 6 (moderately fleshy) I was so excited! Moderately fleshy! When I gushed to Carol about this later in the weekend she did backtrack a bit- apparently he is somewhere between a 6 and a 7, or perhaps a 6 for his body type. But who cares- anywhere close to merely “moderately fleshy” is a huge victory for my “air fern” (Carol’s expression for an easy keeper). In solidarity with my pony I gorged myself at the potluck before we got the low down for the ride. Rumors had it that the temps would get up to 104, so the open riders had a loop lopped off their ride. No such luck for the Novice and Competitive Pleasure riders. 24 miles it would be. The night was another long series of randomly timed whooshes! and thumps! from Sebastian’s hearty eating habits. I tried to focus on how wonderful his gut sounds have consistently been at vet checks and not stress about the lack of sleep. Less trailer rocking happened with the new tie system. He did lie down for a couple of hours so we both got a bit of sleep. 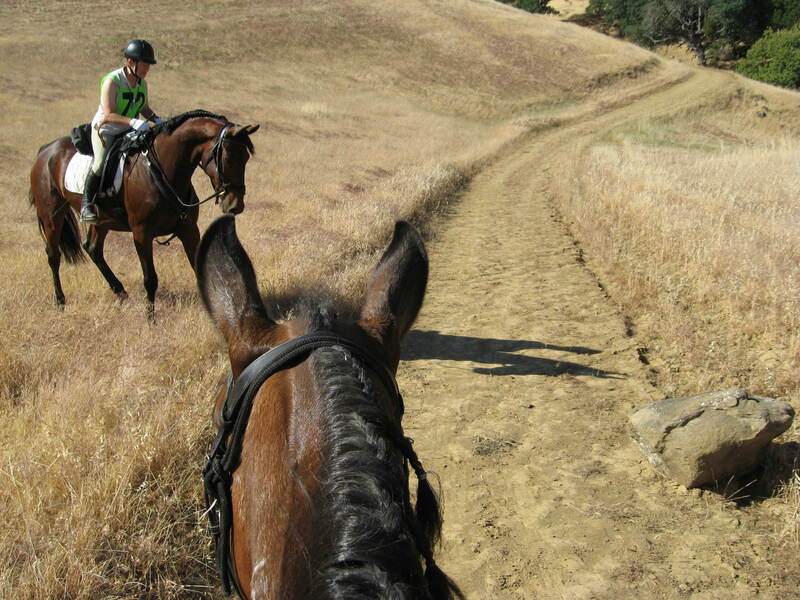 It was steep and an excellent use for extra pony exuberance. Also it was beautiful. 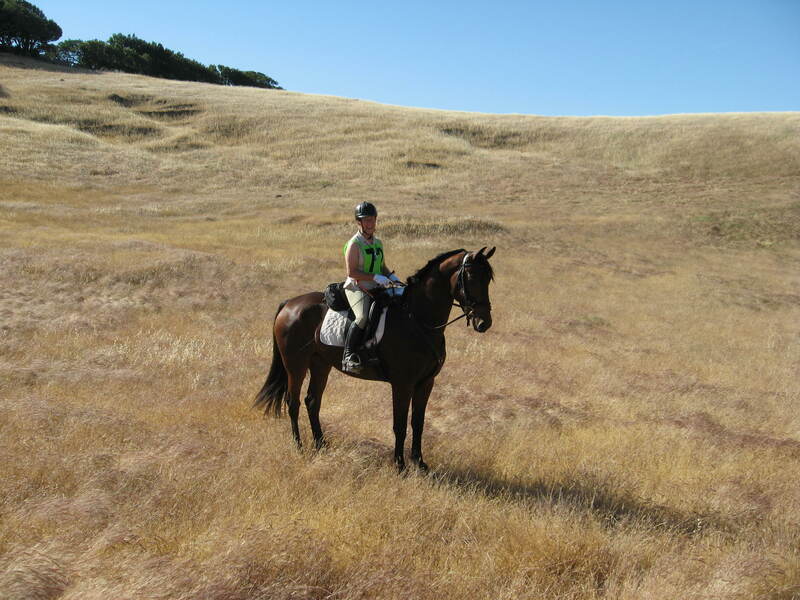 Here I am with my stubby… um, compact and efficient at dispelling heat… pony. After many ups and downs we had the first horse fitness check. I was delighted that Sebastian came in at a 9 and 3 (pulse of 36 beats per minute and respirations of 12 per minute after 10 minutes rest). Apparently his upbringing in the mountains of Nevada had prepared him for the rising heat. 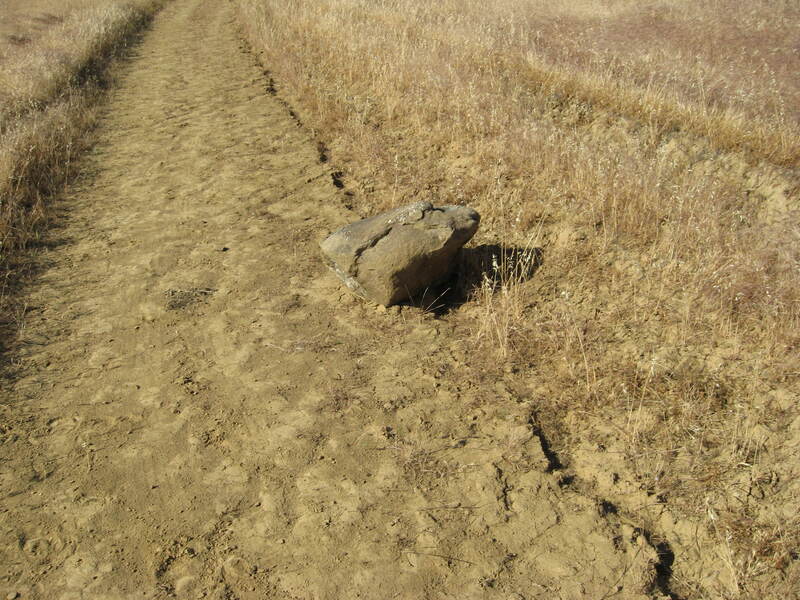 Shortly after we came upon a terrifying obstacle in the trail. Sebastian had not originally realized how dangerous the situation was, but Poki left the trail hurriedly to keep a safe distance. Jill was laughing! That fool! Look at this ROCK OF DOOM! At this point Sebastian was starting to realize the dire position we were all in. But summoned his deepest courage to snort at the rock from close range. My hero. It must have been sleeping. Didn’t eat any of us. The temps continued to climb. I was pleased that Sebastian got an 11 and 4 at his next pulse and reparation check (pulse of 44 beats per minute, respirations of 16 per minute). The volunteers were excellent about providing horse and human water at every opportunity and I was drinking like crazy to keep up. Unfortunately I didn’t have any electrolytes for myself, so Sebastian shared his paste. Eduramax tastes okay, in case you’ve ever wondered. From the looks of Carol’s concerned expression and the number of horses being attended to, this was the vet check where a lot of horses were found to be in trouble. The heat was really taking its toll and the number of pulled horses was rising (by the end of the day 6 or 7 out of 34 were not able to continue). 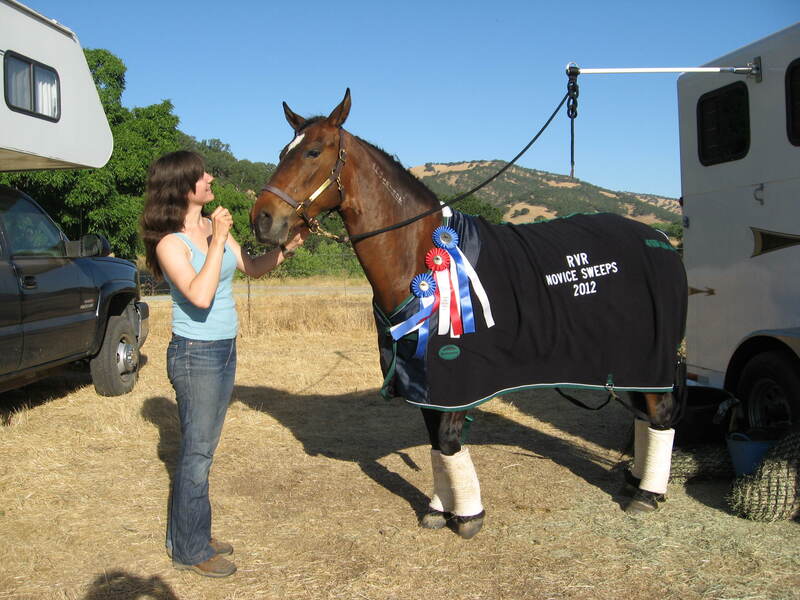 Region 1 of NATRC focuses the judging of the horse on soundness, rather than creating obstacles to assess the horse’s manners on the trail. 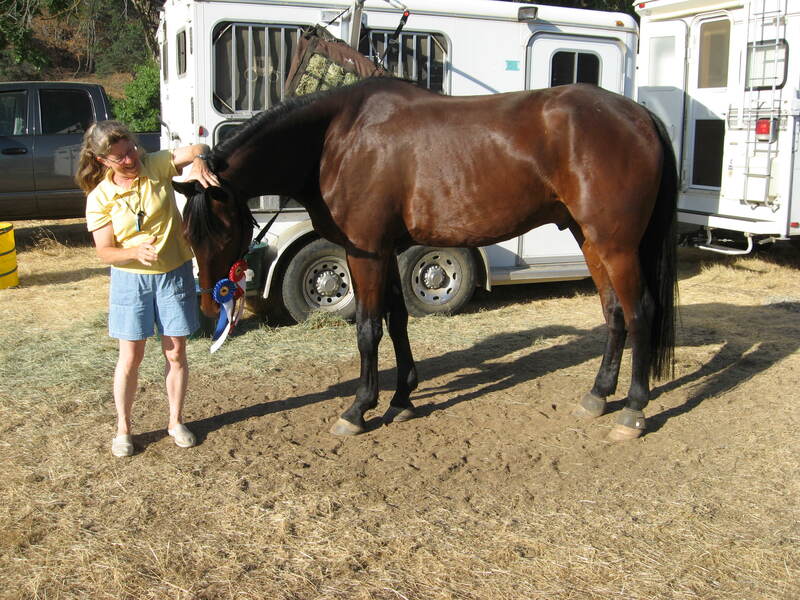 Carol commented on Friday that this kind of heat makes the veterinary judging straight forward. Any fitness, soundness or metabolic issues are very likely to show up under this amount of stress. 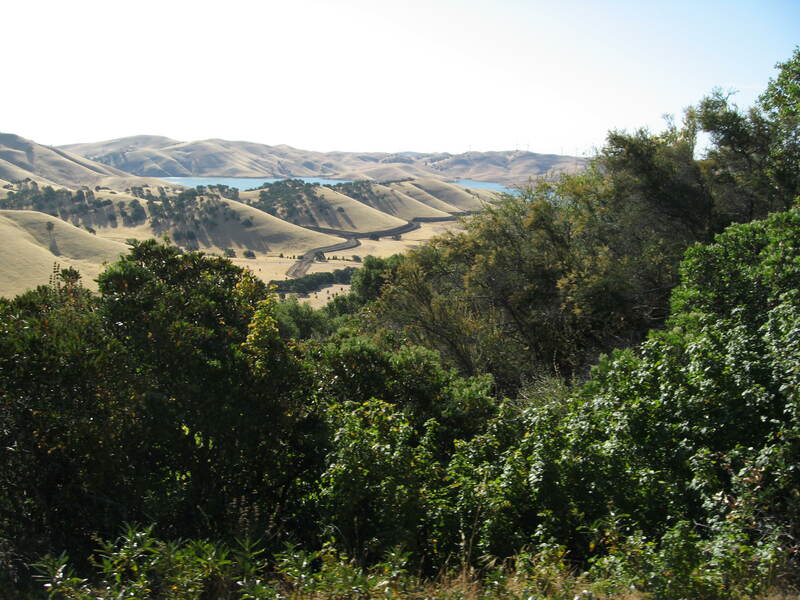 After the check we rode out onto a long, exposed ridge with conditions that B describes as “God’s Hairdryer.” The wind was warm and strong. Sometime after this totally staged moment where Sebastian and I were in the lead (Pokani was the lead pony at all times), I suddenly found myself riding a terrified steed at a gallop, closing in fast on Pokani’s tail. After a second I realized that the wind had came up very strongly and at just the right angle to turn my penny into a flashing, rattling noisemaker that Sebastian was certain did not belong on his back. 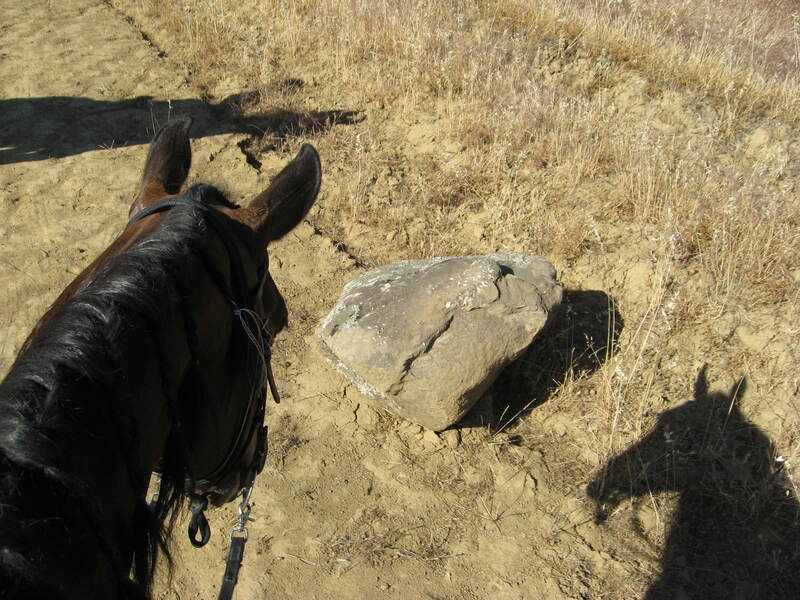 Nothing like figuring out that some part of you is what is scaring the daylights out of your horse. 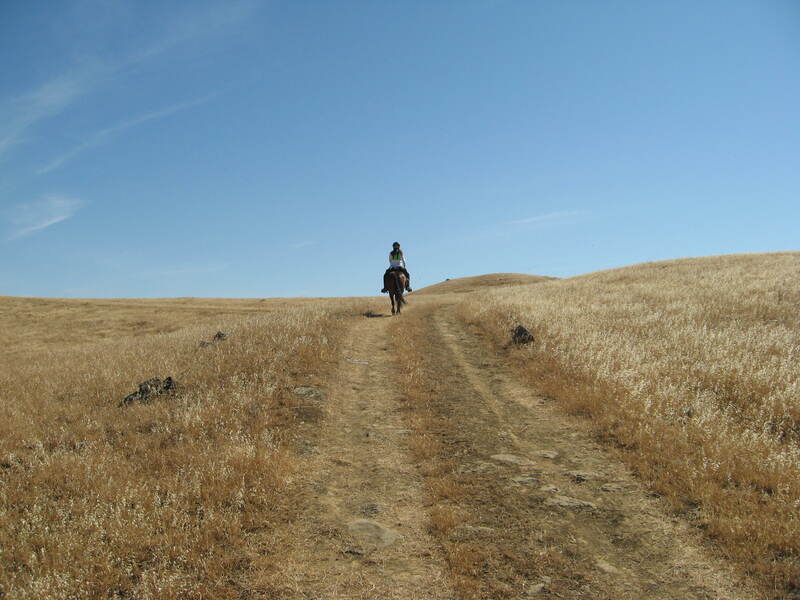 I was able to hold it down with one arm and ride with the other, but it made for a tense rest of the loooong ridge, dealing with passing horses and shortening and lengthening the reins with only one hand available. I was so happy to eventually see the lunch break come into view. Given the heat, they held us an extra 15 minutes at lunch to help everyone recover. I sponged down Sebastian, who was looking like a Zebra with crusted, white tracks of salt all over his body. It was such a dry day that the sweat would dry almost immediately. 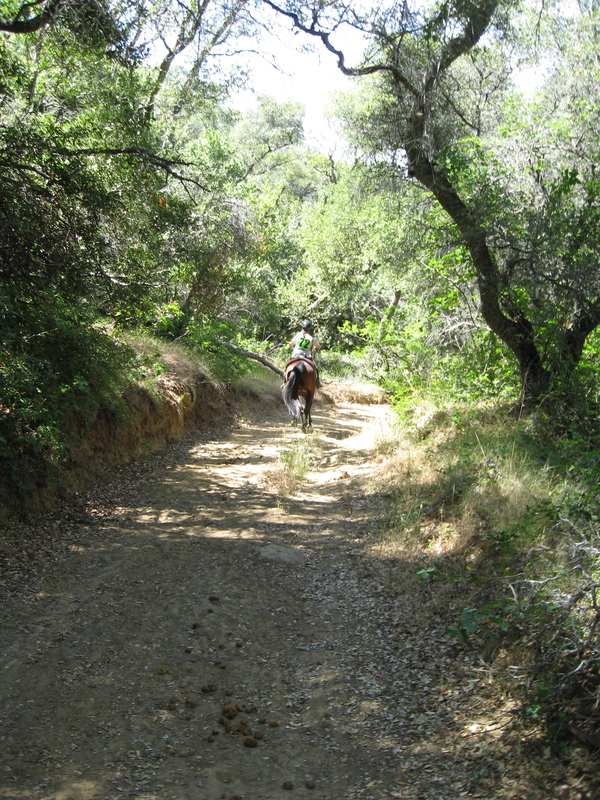 It was spooky to reach down during the ride and feel an essentially dry horse neck in such heat. I also hosed myself down and choked down some sustenance- salted ham and cheese wraps. Our third pulse and respiration check was a 10 and 2. I would have been very pleased with those numbers at a first check on a cool day. Phew! Good boy! Not too many pictures were taken after this point in the ride. It felt a like sort of a frivolous use of energy. But here is Jill going down that long hill that we climbed in the morning. Or maybe it was a hill closer to the P & R. Things have blurred. The long downhill at the end of the day was a challenge. Especially for the poky pony. Sebastian is, shall we say, careful going downhill and does not think it prudent to rush. Turns out he is not, however, against a small buck in protest when he loses his leggy partner around a blind corner. This was very effective human training on his part. I hollered to Jill and she very graciously made sure not to lose sight of us again. He is still a slow walker. Sigh. 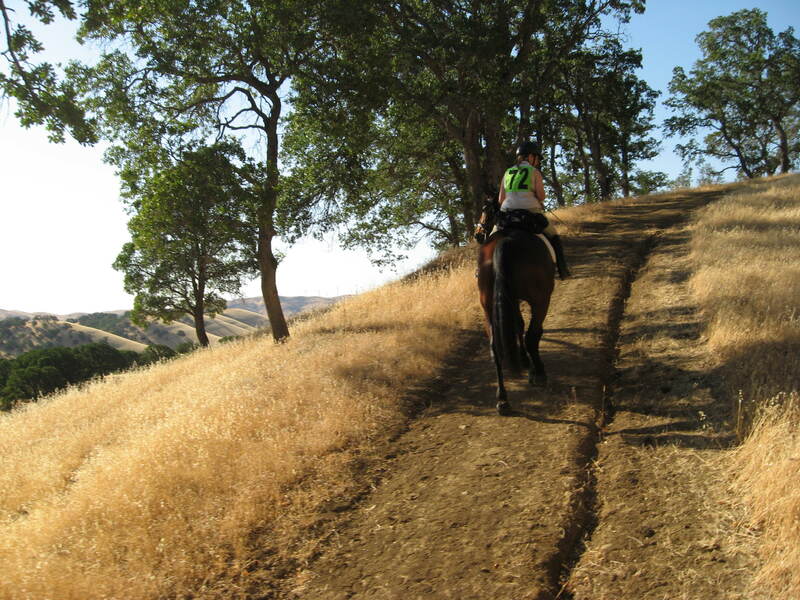 I was so delighted to see the valley floor after that long descent. I was less delighted to ride into the dense, smothering heat that was rising from that floor. The air was still and for the first time all day the heat really felt oppressive. We needed to make up time and the ponies, strangely, had plenty of energy so we trotted through that oven. Turns out it was 108 or 109 at that point. Definitely no pictures from the rest of the evening at camp. I felt like I was wading through soup. We tucked the horses into their meals and water and gave them thorough baths. Both of them ate and drank very well all day, thank goodness. Both Sebastian and I were less than perky at the final vet check, but we did okay. I had an exciting wave of nausea in the line to the Mexican dinner feast, but held it together and took in a very restorative mountain of food. The awards ceremony was especially nice because the Horsemanship judge, Jamie, was so positive and took the trouble to name several people individually and describe things they did very well on the trail. Sebastian won his Novice class and we got Novice Sweepstakes again!!! I think we have to retire now. No way to keep up that streak. I reconfigured hay nets again and we both slept pretty well that night, although I was still slick with sweat as I laid down to sleep at 10:30 pm. 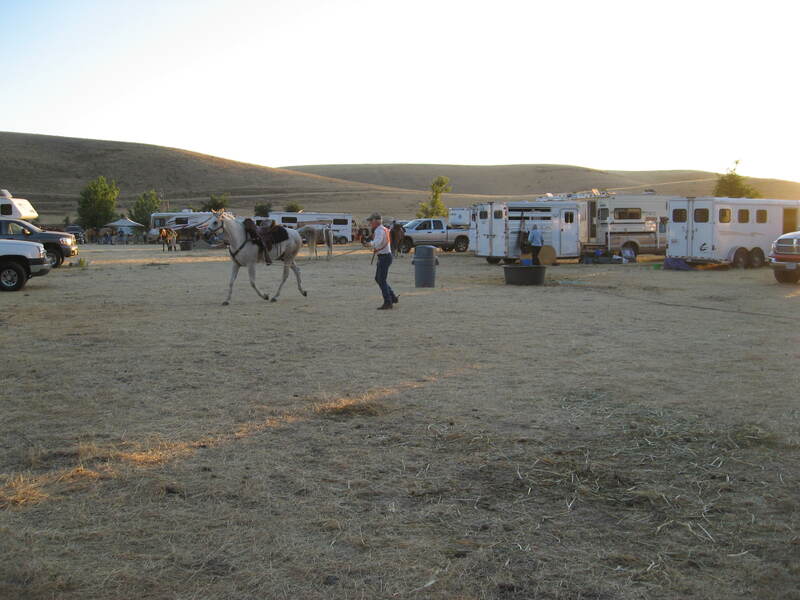 In the morning the tough Open and Competitive pleasure riders were preparing for their day 2. Jill and I did the obligatory photo sessions with the awesome loot that we won.That’s a leather halter with engraved nameplate for the first place in Novice Horse to go with that beautiful cooler for Sweepstakes! So fancy! Jill won a very cool ride time watch for her first in Novice Horsemanship and Pokani won second in Novice horse. Here Jill is circumventing the do-something-spastic-so-the-horse-puts-his-ears-forward routine that is usually the responsibility of the photographer. Thank you Jill! In the end it was a really great weekend. A hard ride in heat like that was not what I would have chosen to do if I had control of the weather, but really it was a gift. It pushed our boundaries (I had no idea that we could do something like that!) and gave me some excellent perspective. I think the conditions of most other Novice rides will seem easy after that one. Knock on wood! 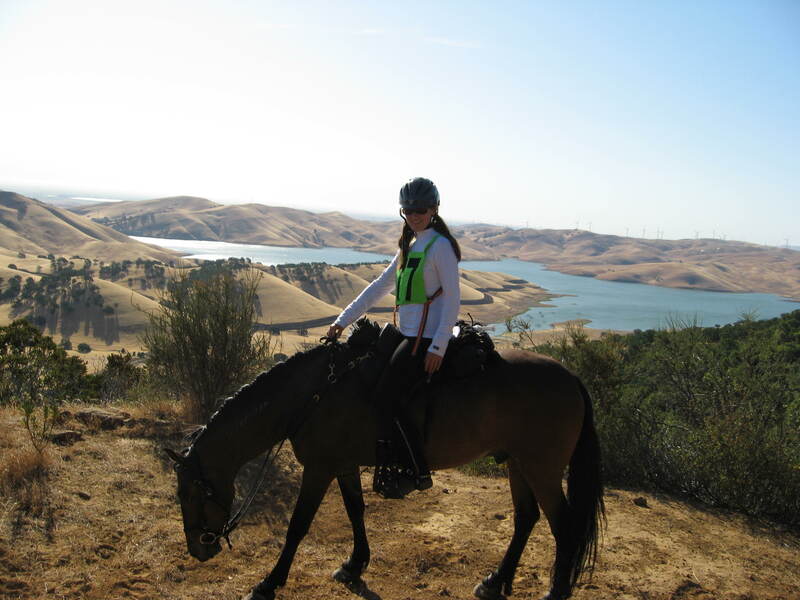 This entry was posted in Horses and tagged competitive trail riding, horses, NATRC, natural horsemanship on June 18, 2012 by fullheartsfarm. What a great report. Keep on writing! !